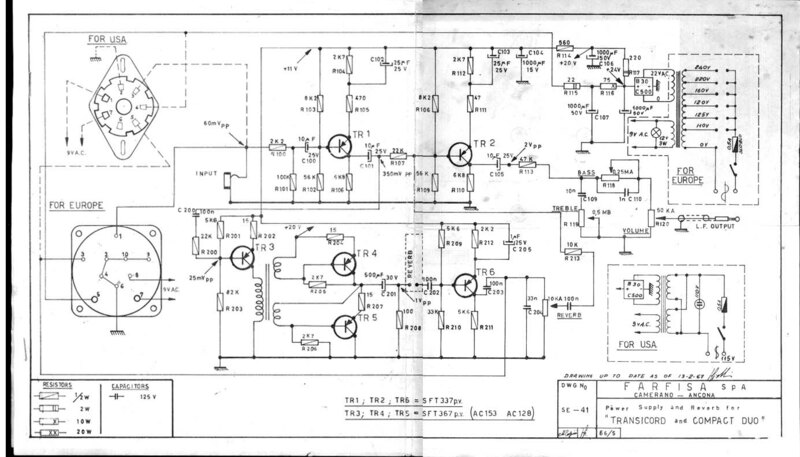 He is the Farfisa F/AR Schematic. The F/AR was an independent preamp and real spring reverb unit that was used to power the Farfisa Compact Duo dual manual combo organ, and the Farfisa Transicord electronic accordion. Both of those instruments will not work without this piece, so it’s pretty nice to have one! Ok, my new schematic disclaimer: Don’t be dumb, and be careful not hurt yourself if you are attempting to work on your organ. You should find a tech to work on your gear, really. That way he can do what he does, and you can do what you do, make music! No item found in feed URL.